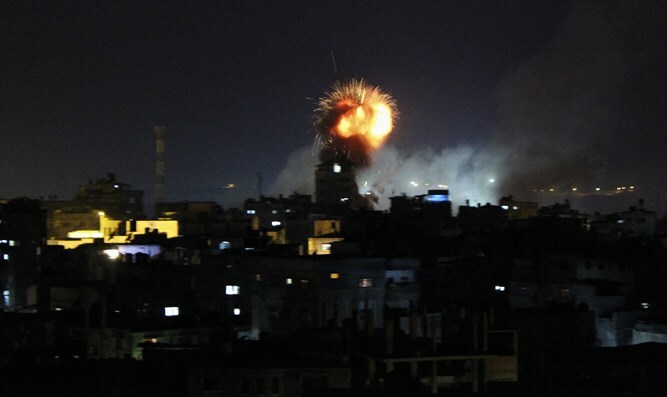 IAF fighter jets target Hamas military compound in Gaza. Terrorists open fire toward Israeli aircraft, triggering rocket sirens. IAF fighter jets on Wednesday night targeted a terror target in a Hamas military compound in Northern Gaza. The air strike was in response to an explosive device that was placed under the guise of the riots and detonated against an IDF engineering vehicle on Wednesday morning. “The Hamas terror organization is accountable for all occurrences originating from the Gaza Strip and the IDF will not allow Hamas to turn the security fence parameter into a combat zone,” said the IDF Spokesperson’s Unit. After the strike, a terror cell fired with machine guns at an IAF aircraft, without actually harming it. Sirens were sounded in response to the shooting. IAF aircraft intercepted the terror cell. “The IDF holds Hamas accountable for all occurrences originating from Gaza and will respond firmly against all attempts to commit acts of terror towards Israeli civilians or IDF troops,” said the IDF Spokesperson’s Unit. On Wednesday morning, during a routine activity in northern Gaza, an explosive device that was placed under the guise of the recent riots along the border was detonated against an IDF engineering vehicle on the western side of the security fence. No injuries were reported. In response, the IDF struck a number of Hamas military targets.